The Standing Stone: Grange Lios, Stone Circle, Co. Limerick. Grange Lios, Stone Circle, Co. Limerick. Location – Located on the R512 between Limerick and Bruff and is only s few hundred meters from Lough Gur. The lake use to be much closer but the level of the lake was lowered in the 19th century. See map at the bottom of the page. Description and History – This is Ireland’s largest stone circle and I can’t believe that I have never been here before. I decided to set out early so that I could get around as many of the sites as possible around the lake but when I arrived the whole area was enveloped in a thick fog. At first I was dismayed because I didn’t think I would be able to get from one site to the next or be able to get good pictures. The fog actually gave the circle a mysterious quality which made the pictures all the better. Luckily I had some GPS co-ordinates to guide me to other places nearby and it quite the experience to be walking across a field and to see a standing stone slowly emerging out of the fog. The circle at Grange is quite something. It is banked in that the stones are pressed right up against an outer henge. The diameter of the circle is 47.5m and is perfectly circular. During excavations a post hole in the centre of circle was found from which the circle could have been measured out with a rope. I don’t think I have ever seen a stone circle with such a variation in stone size. Some are barely over 50cm tall while the largest (known as Rannach Croim Duibh) stands at 4m in height. The bank into which the stones are set is ditchless and roughly 1.2m high and 9m wide. Unusually there is a formal entrance to the circle on the E side of the circle. A stone lined entrance has been set out and is still impressive to walk up and into the circle...especially in the fog. A lot of archaeological material was found during excavation and carbon dating indicates a construction date around 2000BC. Beaker ware was found at the site and was found to be very similar to Beaker ware found in Somerset in England and to me that would indicate a close connection between these people. Another stone circle and two standing stones can be seen from this site, when it is not foggy, and there is a possible megalithic tomb on the other side of the road that would be visible from the circle is it wasn’t for the modern road. This is truly a fantastic site at an amazing place. Even if you only have a passing interest in these places you will certainly be impressed by this place. Summer solstice 2010 (20th and 21st June) - I decided to head down to Lough Gur for the Summer Solstice. I had always read that the circle was aligned to the entrance on June 21st. Sadly this is not the case. The sun rises near the entrance but not through it. I have since learned that it is aligned with Lughnasa on August 1st so I will be heading back to the circle then. However, spending the solstice at the circle was a worthwhile experience and it really took my breath away. I went twice. First on the 20th and then again on the 21st (the day of the solstice). I went the day before because I knew there would be less people and that the sun would rise in basically the same place - there would be a barely noticeable difference. It turned out that conditions were better on the 20th than the 21st, although conditions on the 21st were still fantastic. All the pictures below were taken on the 20th. I woke at 3am on the 20th and had a look outside and saw stars which was a good sign...I also saw light on the horizon so thought I had miscalculated the time of the sunrise. I rushed to the circle and was the only person there. 45 minutes later and still no sun. I hadn't misjudged afterall. People started to trickle along and by 5am there were about ten of us. At about 5.20am the sun finally peaked over the hill in a sudden burst of light. It was quite spectacular even though it didn't rise where I had expected. The sun did appear to rise between two of the stones but not at the entrance. The sun did hover above the massive Rannach Croim Duibh which cast a shadow over the interior of the circle. I will definitely heading back for Lughnasa and maybe Samhain in October. About 100 people showed up on the 21st to see the sun rise which was great to see. However, the constant slamming of car doors as people arrived, the flash of cameras and the beep beep beep of mobile phones meant the atmosphere wasn't as nice as the day before which had been quite tranquil. Overall it was a fantastic experience and following the previous years bad weather those of us who went to see it were very lucky to have such clear days. The pictures of the solstice are at the bottom of the page. Difficulty – Easy to find and traverse with parking at the site. Tim, the owner of the site, has provided a handrail to the circle as it can get a little muddy and he had erected a fence to keep cattle out. He also sells postcards and a very good little booklet about the sites around Lough Gur as well. He does ask for a donation to the upkeep of the site and there is a little collection box for this...I encourage you to donate. For more stone circles, click here. For more sites around Lough Gur, click here. For more sites in Co. Limerick, click here. 4.20am - The stones seem massive when silhouetted against the sky. 4:30am - Rannach Croim Duibh against the morning sky. 5:22am - The sun finally puts in an appearance. 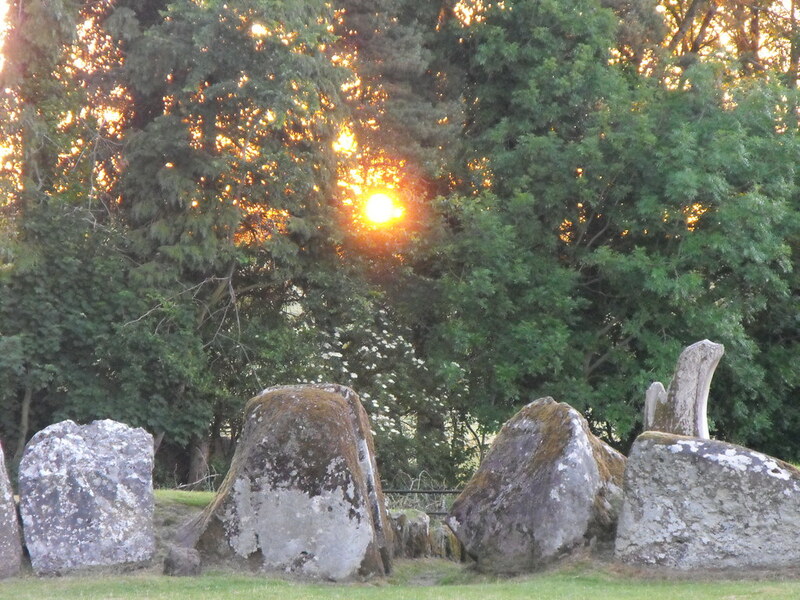 5:25am - The sun hovers between these two stones. 5:30am - The sun has fully risen and is moving across the sky. 5:45am - The sun sits atop Rannach Croim Duibh and cast a shadow over in the interior of the circle. I have been fortunate enough to photograph this great circle in many different conditions and times. I have seen it in fog, sun and now snow. In January 2011 I made a trip out to the circle yet again to take advantage of the snow. Here are the results. Great photos of the stone circle at Grange. They demand a visit at sunrise or sunset and more so on a foggy day. Thanks for photos. Congratulations on these photos. I have happy memories of visiting the area. Ireland has hundreds of megalithic sites that deserve to be better known. Thanks for your article, this place is amazing. I think it's likely that once, when the circle was built, it was aligned with the summer solstice. After 4000 years the astronomical phenomenon called precession of the equinoxes makes the orientation change a few meters.